1. A Member must be aged 18 years or above to be eligible for a Nexus Mobile membership. 2. On acceptance of the application for membership, a Member will be issued a Token Card based on the mobile number that has been registered with Nexus Mobile. Each Member shall only be allowed to register not more than two mobile numbers under the Member’s ID (NIC / Passport number) and the Member must produce the NIC / Passport at the time of the registration. 3. The Nexus Mobile membership will be registered (including number changes) in accordance with the information furnished by the physical bearer of the mobile device at that time of applying (or changing the number) for a Nexus Mobile membership. Nexus Mobile takes no responsibility for points earned, redeemed or any transactions associated with it, if the user of the Mobile number as registered with Nexus Mobile or as registered with the mobile provider; differs from the individual in possession of the number/mobile device at the time of registration (including number changes). 4. A Member should renew the membership within 90 days of its expiry date in order to retain the balance points on the expired membership. Failing to do so, the Member will forego the aforementioned points. 5. Nexus Mobile reserves the right to terminate the Nexus Mobile membership and to alter or amend the conditions of operation of the Nexus Mobile Program. 7. At Keells, you receive 1 point for every Rs. 300 you spend. If you shop for over Rs. 25,000 within a calendar month, you will receive further 2 points for every 300 points you spend, while if your total shopping is worth over Rs. 50,000 you would be entitled to 3.5 points for every Rs.300 spent. So the more you shop, the more you earn and more you save! Bonus points are calculated at the end of each calendar month and credited to your Nexus Mobile Membership account by the 10th of the following month. 8. Nexus Mobile bonus points will be calculated separately for transactions done at participating establishments. 9. It shall be the sole responsibility of the Member/s to ensure that accurate details are submitted to Nexus Mobile and at Participating Establishments. Nexus Mobile shall not be held liable in any event for the inaccuracy of information provided due to the negligence of the Member/s. 11.Nexus Mobile is under no obligation to award points for any reason beyond the qualifying transactions or any other point schemes awarded by Nexus Mobile. 12.Nexus Mobile Number and the Token Card remains the responsibility of the Nexus Mobile Member/s, as well as security details relating to the membership. Nexus Mobile shall not be held responsible for any loss arising from any Member failing to ensure the safe-keeping of these items/details. 14.The Nexus Mobile member must redeem Nexus Mobile points accumulated at specified Participating Establishments within the time periods stipulated by Nexus Mobile from time to time. Any Nexus Mobile points not redeemed within the stipulated time frame shall be deemed to have expired and will be cancelled. 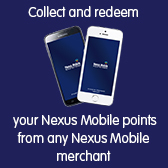 15.Nexus Mobile members may earn and redeem Nexus Mobile points at all Merchants. Earning and redemption of points are not possible at Nexus Mobile partners. 16.Nexus Mobile points are not convertible to cash. 18.All Members may receive Nexus Mobile communication including updates and promotion details via various mediums including SMS / messaging apps / email / post / social media, the Nexus Mobile website or via other direct communication methods; and consents to receive communication from the above channels. 19.The membership shall only be used in respect of offers by the Participating Establishments and in accordance with the terms and conditions set out herein and any amendments to the same at the discretion of Nexus Mobile. 20.Nexus Mobile shall have the right to amend, modify or supplement the Nexus Mobile terms and conditions herein, including those relating to the withdrawal or addition of offers, as it deems fit from time to time, without any prior notice to the Member. 21.The Member shall notify Nexus Mobile in writing/ through the call center / web site or electronic application of any change of personal particulars at the first reasonable opportunity after such change. If Nexus Mobile requests the member to update the information via any mode or electronic platform of Nexus Mobile that should be done so by the Member. 22.The Members’ privileges and rights to enjoy the offers are governed by the terms and conditions hereunder and such other terms and conditions laid down by the Participating Establishments. Failure to comply with such terms and conditions shall result in the refusal of such offers by the Participating Establishments, and/or the cancellation of the Membership by Nexus Mobile. 23.Members shall abide by the following in using the Nexus Mobile Membership Card or Mobile number registered with Nexus Mobile. The Members shall present the Card/mobile number before or upon making any purchase from a Participating Establishment. The offers may not be used in conjunction with each other at the Participating Establishment/s, unless otherwise stated. Each Participating Establishment has the absolute discretion to reject the Card/mobile number if it has reasonable grounds to suspect, or there has been any report that the Card /Mobile number has been tampered with, whether intentionally or not/mobile number is no longer active / incorrect. Signatures on all request documents are to match the signature on the original application form filled by the member. Nexus Mobile bears the right to refuse any requests if signatures don’t match the original application. For Nexus Mobile numbers which have been registered under an organization or entity, it is the member’s responsibility to ensure that points accumulated under that registered Nexus Mobile number are transferred; or that the ownership is changed when the individual no longer continues to use that number. Nexus Mobile takes no responsibility for instances when redemptions have taken place when the physical owner of the number has changed. Nexus Mobile shall not be under any obligation to replace any Cards which have been misplaced, lost, damaged or stolen. Members should notify the Nexus Mobile Call Centre of any loss or damage to the Card forthwith. Replacement cards may be obtained on request at a rate stipulated by Nexus Mobile. 24.All relevant taxes (including VAT) or service charges incurred in all transactions involving the presentation of the Nexus Mobile Membership Card shall be borne by the Member if applicable. 25.The list of Participating Establishments and the offers available to a Member may be revised from time to time by Nexus Mobile as it deems fit. Whilst every reasonable endeavor will be made by Nexus Mobile to ensure that offers shall be made available by the Participating Establishments, Nexus Mobile shall not be liable in anyway and no Member shall have any claims whatsoever against Nexus Mobile if the membership is not accepted or dishonored by a Participating Establishment under the Nexus Mobile Program. Nexus Mobile shall not be liable for any loss, physical injury, illness, costs or damages resulting from or during any visit to or purchases made from any Participating Establishments. Nexus Mobile, its assignees, directors, staff, agencies, consultants or associates shall not be liable to any Member in respect of any issues concerning the issuance of the membership and the operation and maintenance of the membership. Nexus shall create, maintain and update information relating to the Member and may at its absolute discretion, disclose any non-confidential information including but not limited to information such as shopping patterns, frequency of visits, basket contents, to any third party in its possession. Nexus Mobile shall not be liable for any defect or deficiency in the goods purchased or services rendered by a Participating Establishment. Any claim whatsoever related to the items purchased or otherwise, by a Member against or dispute between a Member with any Participating Establishment or any other party shall be settled between the Member and such parties without any reference to Nexus Mobile and Nexus Mobile shall not be affected by nor be obliged in any way to be involved in any such dispute. No claim by any Member against any Participating Establishments or third party shall be subject of a claim / defense or counter claim against Nexus Mobile. The Member shall not hold Nexus Mobile liable for any loss if Nexus Mobile is not able to perform its obligations under this agreement due (directly or indirectly) to the failure of any machine, data processing system or transmission link or civil or industrial dispute, act of God or due to any other event beyond reasonable control of Nexus its servants, agents or subcontractors. Nexus Mobile shall not be liable for any loss, (whether direct, indirect, incidental, special, punitive or consequential) or damages suffered by reason of the Member’s use or inability to use the Card or any disclosure (inadvertent or otherwise) of any information concerning Member or for any error, omission or inaccuracy with respect to any information disclosed. 27. Nexus Mobile may at any time and in its absolute discretion terminate this Nexus Mobile agreement and/or cancel and/or terminate the member’s membership without any reference to the Member, and without assigning any reason for same. There will be no refund of the joining fee paid by the Member to Nexus Mobile or any part thereof if the membership is cancelled or the right to use the membership is terminated. 28. In the event that the function of the memberships are expanded to include additional services for which additional subscription fees or charges are to be payable, the Member shall be liable for any such fees and charges that maybe applicable prior to the use/consumption of such services and Nexus Mobile shall not be liable for all charges of whatsoever nature in connection with or pursuant to the use of such services. 29. For the avoidance of doubt, it is hereby agreed by the Member and Nexus Mobile that all provisions contained herein shall continue in full force and effect notwithstanding the termination of this agreement and/or the expiry of the membership in accordance with the terms of this Nexus Mobile Agreement. 30. If any one or more of the provisions of this agreement or any part thereof shall be declared or adjudged to be illegal, invalid or unenforceable under any applicable law, such illegality, invalidity or unenforceability shall not violate any other provisions of this agreement, which shall remain in full force and effect. 31. This agreement is governed by and shall be construed in accordance with the laws of the Republic of Sri Lanka. 32. All disputes or differences of any kind whatsoever which may arise between the parties in connection with or arising out of this agreement relating to the Nexus Mobile and remaining unsettled for a period of fourteen (14) days from the date of notification of such disputes shall be referred to arbitration by either party in accordance with the UNCITRAL Rules of Arbitration for the time being in force. The place of arbitration shall be Colombo and the language of the proceedings shall be English. 33. Due to printing lead times, the printed terms and conditions in stores/Participating Establishments may not reflect the most recent changes. The most recent Terms and Conditions of Nexus Mobile will be available in the Nexus Mobile website. “Token Card” shall mean the Nexus Mobile Token Card issued at the total discretion of Nexus Mobile on the terms and conditions and for such fees as Nexus Mobile may decide from time to time. “Nexus Mobile” shall mean the mobile based loyalty program of Jaykay Marketing Services (Pvt) Ltd.
“Nexus Mobile Points” shall mean the loyalty points accumulated by a Member under Nexus Mobile and is based on the purchase of qualifying goods and services.